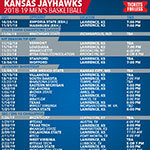 Click here to download a printable KU Basketball schedule! ROCK CHALK JAYHAWK! Welcome to the University of Kansas Men’s Basketball Schedule website! You’ll be able to find the entire men’s basketball schedule, including dates, opponents, location, and results for all KU Men’s basketball games. Each game will give you details, such as the location of the game, and also give you a link to purchase tickets for each game! Check out our “Get Jayhawks Tickets” link for tickets to all Jayhawk home and away games! NEXT GAME: Final Four! – Get Tickets!